In honor of Gramps McHops’s 60th birthday, today’s Tasting Note is a brew I know he’d love and one of the finest beers in the world. NOSE: A big, beautiful bouquet. Floral, citric, bright…the smell of fresh-cut wheat on a harvest day. This is what every Hefeweizen nose should be like. TASTE: The crisp, sweet taste of fresh, pale wheat mixed with a refreshingly sour apple flavor up front. Some lovely spices like clove and anise and a bold, banana-ester flavor in the middle. Clean, drying finish that makes you immediately want to go back for more. Fortunately, Weihenstephaner is usually served in a big, ol’ Weiss glass so there’s plenty more where that sip came from. MOUTHFEEL: Very smooth, drinks lighter than its medium-body. Excellent, champagne-like carbonation. DRINKABILITY: I’ll admit that Hefeweizens aren’t my favorite style, but I’m not made of stone. 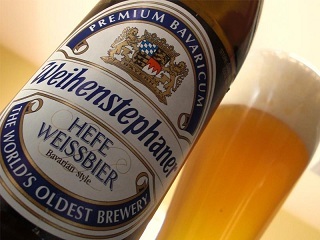 The Weihenstephaner is just plain awesome. Clearly the “Best in Class” of the style. No matter how you slice it, it’s just a great brew. Posted in Tasting Notes.Tagged HefeWeisse, Hefeweizen, J. Clyde, Weihenstephaner. Thanks Barley, Slouch. If I had one in my Fridge, I might have had it for B’fast, but alas, I don’t. Next Post YOU KNOW, FOR KIDS!